The 2012 Macy’s Fourth of July fireworks are just around the corner. The 36th annual summertime staple will include 40,000 fireworks set off from six barges in the Hudson River between 18th and 43rd Streets, beginning at 9 p.m. This pyrotechnic spectacular is not to be missed, though the coveted hot spots for watching along the West Side Highway fill up quickly with crowds. Metro has you covered for some of the city’s other best views of the fireworks, for both big spenders and the budget-conscious. 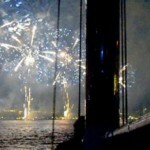 Get up close and personal with the fireworks on a river cruise. Step aboard one of Classic Harbor Line’s impressive yachts and enjoy cocktails and hors d’oeuvres as you watch the show in style. It’s a pricey endeavor, but the cruises last nearly three hours and offer incredible views from below the show. 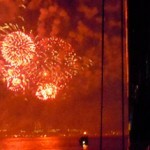 NEW YORK — Forty-thousand fireworks will explode over the Hudson River this Fourth of July, drawing tens of thousands of patriotic spectators to Manhattan’s West Side. The “Ignite the Night”-themed Macy’s display, kicking off at 9 p.m. next Wednesday, will feature performances by pop superstar Katy Perry and award-winning country artist Kennny Chesney, synchronized with the colorful raining sparks. “We have put together a show like no other, filled with incredible high-flying effects, choreographed to a soaring, patriotic and exuberant score that will cap off a magnificent day of celebration for millions,” Amy Kule, executive producer of the fireworks, said in a statement. Those who want a front-row seat to the 25-minute pyrotechnics should head to the West Side between 18th and 43rd streets, staking out a spot as early as 5 p.m.
Backpacks, lawn chairs and other large objects are prohibited, but it would be a good idea to pack some water, because temperatures are expected to climb into the high 80s that afternoon. DNAinfo.com New York put together a guide of all the best places to catch the show. Hudson River Park will offer exclusive VIP viewing of the fireworks on the tip of Pier 84, at West 44th Street and the Hudson River, for those who are willing to shell out. The VIP section, which boasts an unobstructed view of the display over the Hudson River, has 500 tickets on sale for $200 apiece. The luxury viewing party includes grilled food, a full bar featuring red, white and blue patriotic cocktails and a live brass quintet performance. The party is kid-friendly and will also include balloon sculptors and face-painters. Tickets cost $100 for children ages 5 to 12, while children under 5 get in for free. Those who don’t want to pay can stake out a spot on the eastern portion of Pier 84, which will be open to the public on a first-come, first-served basis. Space on the pier will likely go fast, as most of the rest of Hudson River Park will be closed during the fireworks. At 2 p.m. on the Fourth, the city will shut down traffic on 12th Avenue as well as the northbound lanes of the West Side Highway between 22nd and 59th streets to make way for a giant block party. The public can access the viewing area on 11th Avenue at the following cross-streets: 24th Street, 26th-27th Streets, 29th Street, 33rd-34th Streets, 40th Street, 42nd Street, 44th Street, 50th Street, 52nd Street, 54th Street and 56th-57th Streets. Views of the fireworks will be limited north of 59th Street, but Riverside Park, along the Hudson River between 59th and 70th streets, may offer partial views of the show. Early birds will have the best chance of getting a spot, because the Parks Department will stop letting people in at 4 p.m., according to the blog Mommy Poppins. The Sky Room at the Fairfield Inn & Suites, 330 W. 40th St., will offer panoramic views of the fireworks from the 33rd and 34th floors. The club boasts the highest rooftop bar in the city, with 360-degree views, including windows looking out over the Hudson River. Tickets are $100 per person and include an open bar from 6 p.m. to 11 p.m. 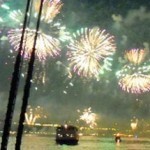 The World Yacht and Circle Line Sightseeing Cruises are co-hosting a Fourth of July extravaganza at Pier 83, West 43rd Street and the Hudson River. The $89 tickets include grilled food, cold beverages, music and carnival games for kids, along with stunning views of the fireworks. The activities start at 4 p.m. 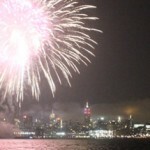 The Golf Club, the bowling club 300 New York and Chelsea Brewing Company are among the places at Chelsea Piers, West 23rd Street and the Hudson River, that will offer an up-close look at the Fourth of July fireworks. Tickets to the Golf Club party are $100 for adults and $25 for children. Picnics are permitted, but not alcohol. 300 New York will offer a place to bowl and a view of the fireworks for $40 a person. The ticket provides each guest with two hours of bowling. Beer fans can enjoy some suds with their fireworks at the Chelsea Brewing Company. For $175 a person, ticket-buyers can enjoy a free brewery tour, an open bar and a buffet dinner. Jason’s barbecue joint in Chelsea Piers also offers a great view of the fireworks. Tickets are $40 per person and include a buffet with burgers, hot dogs, grilled baby back ribs, corn on the cob, baked beans and more. Those who want to get out on the water to see the fireworks, along with the Statue of Liberty and New York’s skyline, can hop aboard a 2 1/2-hour Classic Harbor Line cruise. Tickets are $300 and include an open bar with beer, soda and Champagne, along with a spread of fruit, cheese and dessert. The yacht leaves Chelsea Piers at 8:15 p.m. Since the West Side Highway will be closed to foot traffic starting at 4 p.m., anyone going to Chelsea Piers will need an authorized security pass to cross 10th Avenue. Security passes can be obtained by pre-booking tickets to any of the Chelsea Piers events. After a long day in the sun, the best way to see the Macy’s 4th of July Fireworks is to hop on a small boat with friends and share a couple of pops while you watch the pyrotechnics. Taking its first Independence Day voyage, the Schooner America 2.0 is the newest addition to Classic Harbor Line’s fleet. Munch on hors d’oeuvres as you sample unlimited local craft beers, like Fire Island Lighthouse Ale, and wines from the Finger Lakes and Hudson Valley. The 105-foot vessel is a replica of the yacht that won the first America’s Cup Race in 1851. Cutting-edge technology makes this version fast and light with minimal impact on the environment. The cruise leaves from Pier 62 and lasts just under three hours. Schooner America is $425 per person; prices for other boats in the fleet range from $275 to $375 per person.